Justice League of America #6 is far less than the sum of its' parts. This is not to say that the book is totally without merit - far from it! Geoff Johns and Jeff Lemire give us many great character moments and some wonderful drama but all of this is incidental to the rather lackluster plot involving the so-called Trinity of Sin and Pandora's Box. Honestly, this book would be much more enjoyable if Johns and Lemire were free to ignore the big epic battles between vaguely defined supernatural forces and just focused on letting the characters be themselves for a time. Many of these characters are green and undefined, particularly in the case of the new Justice League members. 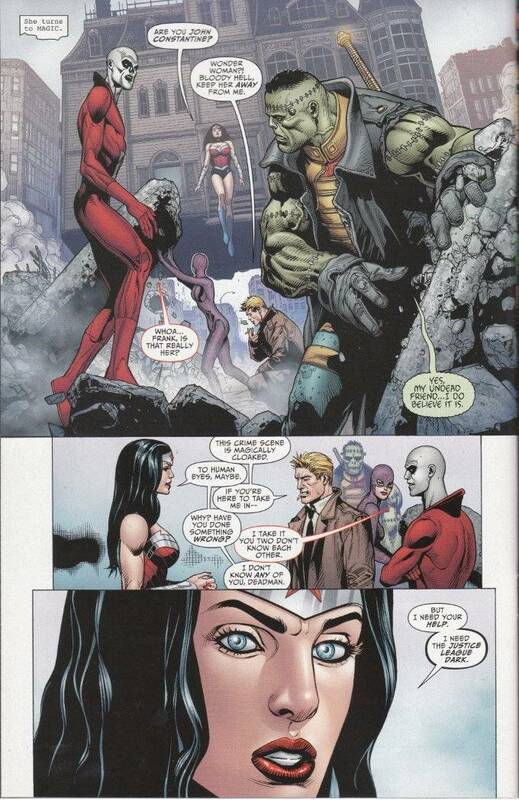 Throwing these characters we've had no chance to get to know and less time to care about beating each other senseless is nowhere near as interesting as watching a brief interaction between Wonder Woman and John Constantine. The Goddess of Truth and a magical conman being forced to work together? Now, THAT is interesting! I also have to give the writers credit for making Wonder Woman the main focus of this issue and letting her be the one to start investigating the case in earnest. Diana rarely gets to take the center stage in these big events and I for one am glad to see her in the spotlight! The artwork of this issue is as uneven as the story. DC Comics really needs to stop putting teams of multiple inkers to work on single books. Doug Mahnke's pencils look decent enough from what I can tell but they are rendered quite differently depending on which of the book's four inkers are working on what pages. Anyone who doubts the power an inker has on the final look of a book would do well to study this issue and learn the error of their ways.